New England will be well-represented during the 2015 Men’s Division 1 College Cup tournament after the NCAA announced the field and bracket on Monday. Boston College (9-7-1), Boston University (12-5-2), the University of Connecticut (9-5-6), the University of Vermont (11-6-3) and Dartmouth College (11-5-1) will all compete in this year’s tournament. 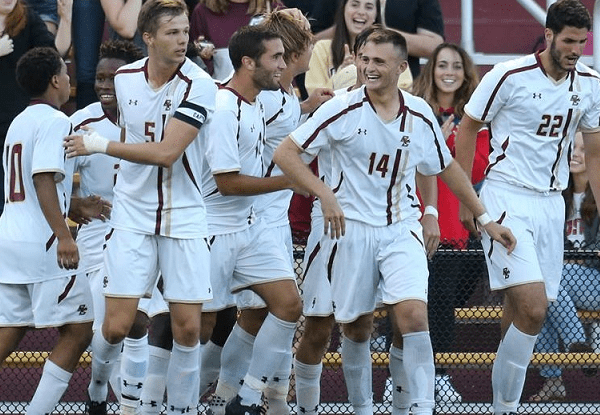 The first round of the tournament, which kicks off on Thursday, will pit Connecticut against Boston University at Joseph J. Morrone Stadium in Storrs, Conn at 7pm while Boston College will face Vermont at Newton Campus Field in Newton, Mass at 6pm. Dartmouth will host Hartwick at Burnham Field in Hanover, N.H. at 5pm. The winner of the Connecticut-Boston University match will face 16th-seeded Indiana in the second round while the winner of the Boston College-Vermont match will meet 14th-seeded South Florida. The winner of the Dartmouth-Hartwick match will be pitted against sixth-seeded Syracuse. All second round matches will take place on Sunday. Next Story → NCAA: BC, UConn & Dartmouth Advance to 2nd Rd.